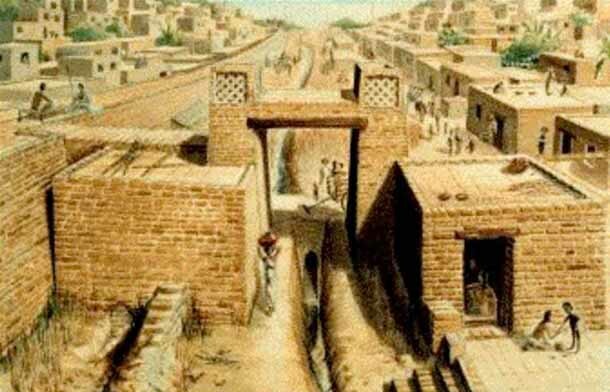 The Indus civilization flourished around cities.The ruins of the cities so far unearthed show remarkable town planning system and excellent system of drainage and sanitation of the Indus Valley Civilization.The city was the heart of the civilization.The life in the Indus cities gives the impression of “a democratic bourgeois economy” like that of ancient Crete. 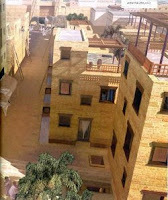 building houses was not permitted.Smaller houses had two rooms,while larger houses had many rooms.The houses can be divided into three main groups viz.dwelling houses,larger buildings,Public baths.There were courtyards attached to big buildings.There was little artistic touch in the architectural design of the buildings belonging either to the rich or the poor.They were plain,utilitarian and comfortable to live.ie they appear well designed and comfortable to live.Some of the buildings were probably multi-storied,However the majority of the houses were two stories high.The staircases of big buildings were solid;the roofs were flat and were made of wood,reed and mud.Walls were often 5 feet thick.Most of the houses had bathrooms and a circular well and covered drains connected with street drains.Ordinary buildings had little ventilation arrangements,as doors and windows were rarely fixed in the outer walls.Doors of entrance were fixed not on the front wall but on the side walls.One could enter a house by the door facing the side lanes of the house.The doors were made of wood.Large buildings had spacious doors. 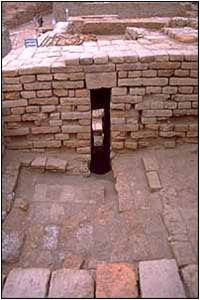 earthenware found in Harappa and Mohenjodaro led researchers to the conclusion that Harappa was older than Mohenjodaro. 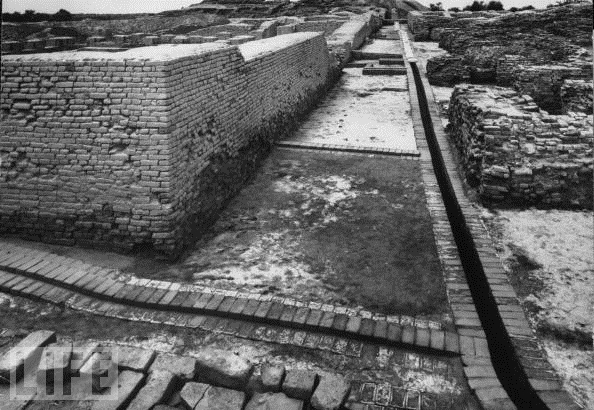 a public storage,and at Mohenjodaro, the "Great Bath",possibly used for religious or ceremonial bathing.The dimension of this was 179 X 107 feet.Their system of drainage is the most complete ancient system and might almost be termed "modern".A brick lined channel flowed down every street and into this main drain ran small tributary drains from the houses on either side.The drains were covered over with brick laid a few inches below street level and which could be lifted if necessary,to inspect or clean.The streets run in straight lines from East to West and are crossed by others at right angles going north to South,making these cities to be considered the earliest examples where a scheme of town planning existed.Everywhere the impression is of order and symmetry.Some of the main streets of Mohenjodaro are of considerable size or broad varying from 9 feet to 34 feet.They ran straight to a mile.They were suitable for wheeled traffic.Sir John Marshall the expert archeologist has marveled at the planned city and drainage system and says that such wonderful buildings were never found in any other ancient civilization.Some slight differences in the earthenware found in Harappa and Mohenjodaro led researchers to the conclusion that Harappa was older than Mohenjodaro. After the destruction of Indus valley civilization and its cities by invaded Indo-aryans,The Indus valley people moved towards south of India.however it took another 1000 years again to establish cities & Civilization there.The sangam literature describes the beauty of those cities in their poems.Two of such poems,one from Perumpanatruppadai written by Kadiyalur Urithirankannanar & another one from Paripadal written by 13 poets are given below:Tamilakam had two ancient cities,one is capital city of Pallavas,Kanchipuram otherwise known as Kanchi and other is capital city of Pandyas,Madurai.The both above mentioned poems describes that these cities are like the Lotus flower. 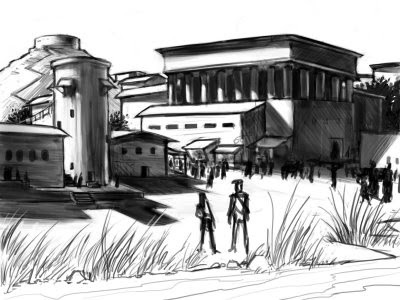 Along with the building of cities,ancient Tamil people also knows the art of building of temples.The earliest temples were built with perishable materials like timber and clay. Cave-temples, temples carved out of the stone or built with bricks came later.Heavy stone structures with ornate architecture and sculpture belong to a still later period.Seventh century saint,Thirunavukkarasu Nayanar always carried a small spade and he was doing cleaning work in every temple such as weeding out the bushes and other growths inside the temple or cutting grasses as most of the temples during his period were made by bricks and weeds and grasses can easily grow between bricks.